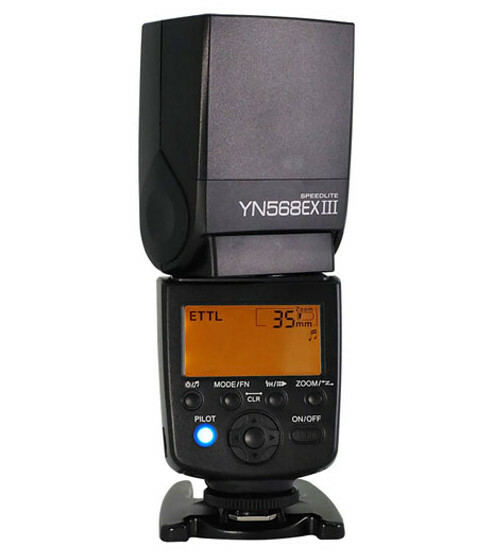 The Yongnuo Speedlite YN568EX III, a mid-range TTL flash with optical wireless control, is now on sale. The YN568EX III is an updated version of the YN568EX II, with faster recycling time and the addition of a USB port for firmware updates. It supports Nikon and Canon’s advanced wireless transmission systems as a master or slave, and works as an on-camera flash for Canon or Nikon, depending on which model you get. Unlike the YN968N and YN968EX-RT, there is no radio module built into this flash, nor does it have fancy new bells and whistles like LED video lamps or lithium ion batteries. It is pitched as a cheap alternative to Nikon or Canon-brand speedlights as an all-rounder for use on or off camera. You can buy the flash now for about $95 on eBay. For the moment, it looks like only the Canon-fit version is available. For more information, see our original announcement article.